WEATHER WARNINGS REMAIN in place today for most of the country, with the south of the country facing the heaviest spells of rain, but the outlook for next weekend is looking good. A Status Orange rainfall warning came into effect yesterday evening for Cork and Waterford, and remains in place until 6pm tonight. Met Éireann said that hazardous driving conditions are expected, with flooding possible. 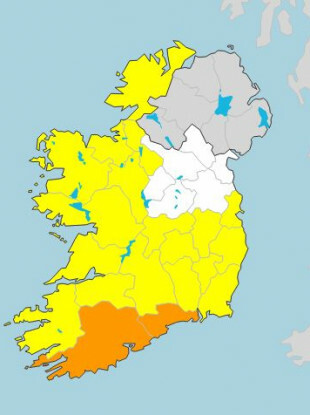 A less severe Status Yellow rainfall warning is in place for Kilkenny, Wexford, Kerry, Limerick and Tipperary. The forecaster has also warned of extremely high winds, with Status Yellow warnings in place for 20 counties. Temperatures today, meanwhile, will barely get into double figures. It’ll still be cold and cloudy with patchy rain across Ulster and Leinster tomorrow, but Wednesday is set to be a dry day with good spells of sunshine. From Wednesday onwards, temperatures are set to climb into the high teens, with Friday set to reach as high as 20 degrees. Looking ahead, the weather over the Easter weekend looks set to be dry and sunny, Met Éireann said. Email “Heavy rain forecast around the country today... but Easter looks set to be warm and sunny”. Feedback on “Heavy rain forecast around the country today... but Easter looks set to be warm and sunny”.